So this week was a bit exciting, in terms of this wee blog, as I hit a milestone I've been building up to for a quite a while. I've been using google analytics to keep track of how many readers I have and where you all come from (which sounds shifty, ha! ), and this month I hit 5,000 unique users per month! Yay! It's a weird one - it feels like there's a bit of an unwritten rule amongst bloggers not to mention numbers or stats, for fear of sounding like you are showing off (or getting too caught up in numbers rather than content). But I work in advertising where we talk about readership ALL the time.. so I'm pretty pleased with this one. I know this is a drop in the ocean compared to other bloggers, but I'm just so chuffed that you lovely lot are out there! Blogging is bloody brilliant, but it's tough work & it's nice to see that I'm not just rambling to myself (although I did have a happy few months at the start where it was just me!). So I thought it might be fun to put together a list of ten bits of blogging advice I've learned so far. I know a lot of this is common sense, and I am faaaar from being an expert, but I love it when people do features like this.. hopefully it'll be useful! This tip (which I originally read on Gem's blog) is probably the most helpful bit of blog advice I've read. Mix up what you write about so that when someone visits your blog for the first time they'll get a snapshot of what they can expect. I write about nail art, beauty, baking, cat, tutorials, home/lifestyle stuff & shopping, so I try and stagger these subjects. That way if a potential reader is into lifestyle posts and baking, but hates nail art, they'll still want to stick around as they know I'm not a one trick pony. It also works wonders for inspiration too - if I'm stuck on what to post next I just look at what subject I haven't covered in a while and write about that! I didn't start to see a growth in readers until I started posting three times a week (I post on Monday, Wednesday and Friday). Posting regularly is good because it encourages readers to come back to see your new content. I love a deadline, so it helps keep me on track too. If you've got a really busy week coming up then don't stress - take advantage of the schedule button so you can write posts when you've got some free time, then set them to go live when you want. Don't take things too seriously: have fun & be a bit daft. Super serious faces are for robots, blogs are for real people. 3. Be friendly & stress-free! It's easy to compare yourself to others, especially when you are just starting out & you have a blank page that's refusing to cooperative. But don't worry about it! There will ALWAYS be someone who has a prettier blog/takes better photos/gets cool free things/has better hair (grr!) than you, but that's cool. There's space for them and there's space for you. Nothing good comes from feeling insecure or beating yourself up pointlessly! I label every post with the category it falls into, so if a reader liked that type of post they could just click one of the words at the bottom to see more of the same - e.g. Edinburgh, how to, shopping, & home sweet home. It makes it much easier to navigate and read the things you like, and helps me too when I want to see what my last post in that category was. 5. You have to love it! Blogging is fun but it is HARD work. Some days I just want to flop on the sofa after a mental day at work, but then remember that I'd planned to take photos/write a post/blog an event/do a nail art design. I put a ridiculous amount of time into writing, researching, taking photos, thinking of ideas & doing basic bloggy stuff.. for barely any material rewards. But it doesn't matter cause I LOVE IT. I love writing and I feel so much more inspired to try new things, as I know I have a platform to share them on. So write about what you love and make blogging easy for yourself. 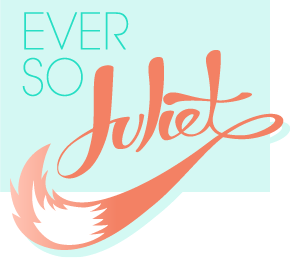 Old Ever So Juliet designs: it can take a while to get your image right. Everyone says this, but reading & commenting on other blogs is such an important part of blogging & a good way to reach new people! Getting comments on a post is brilliant, and I always check out whoever leaves me a comment, it's a nice way to interact with readers. Resist the temptation to just promote yourself - that just comes across as spam. Instead just be a pal, say what you like about the post/blog/whatever & get a conversation going. You don't need to constantly post photos of yourself, but help your readers get to know you. Set up an "about me" section so people can learn a little more about you, use twitter & instagram to share thoughts & photos from your life & be chatty. Everyone loves photos. A visual post is a pretty post, and you don't need a fancy camera to do this. I use my iphone a lot (here and here for example) - just make sure you are taking photos in natural light where possible for clear photos. I love blogs with big photos - no point in making them tiny and having to squint to make out the details! Make your blog stand out by writing things that are interesting and unique to you. Share your favourite recipe, make up a tutorial, write about what you've been up to, try a new make up brand, invent a weekly feature, whatever you like! Obviously you're going to cover some things that are pretty common (I think every blogger in the world has a leopard nail art tutorial!) but it pays off if you do something new. Ages ago I wrote a tutorial on how to use a hair doughnut cause I couldn't find a clear one when I wanted to try it, and it is my best performing post by far. It's had over 28,000 views and ranks really highly in google, which is brilliant for bringing new visitors to my blog! I know it can be quite strange promoting yourself, but put it out there! A blog is there to be read, and getting your friends and family to share it is a great way to start. I promote every post on my personal facebook (as well as the ESJ facebook & twitter) and loads of people click through. But just remember that once you've put something out there ANYONE can see it. That means your parents, potential employers, old school pals, anyone. If there's something you'd rather only your friends knew then don't blog about it. Also it's polite to ask your friends/partner/family if you are going to put up photos of them. Obviously all of these tips are things I find helpful, so if you don't agree then don't worry! The best thing about blogging is that it's YOUR space to do exactly what you want with. Aw, isn't blogging nice. These are great tips :D Thanks for the advice and congrats on your milestone!!! Great tips. I'll keep the, all inmind More importantly... CONGRATULATIONS!! That is so rad. These are great tips, especially for a newbie to the blogging world like myself! Also, congrats on the landmark! That's impressive but not surprising: you have a fantastic blog that deserves every one of those readers. At the moment i'm currently having layout problems and need to update it from looking like a 2007 myspace page, so i defiantly feel adding large photos distracts attention away from my shocking layout. very interesting ! after years or being scared of doing my own blog I just did the big jump and I just open one a week ago. I need to work a lot on it but got to start somewhere !! anyway many thanks for your post !